The Chinese show great respect and adoration to the Lion, an ancient figurehead of their shogun past and you must do the same. Conquer this oriental 5 reel uk slots online game and bestow the power of the golden lion to bring you great riches, free spins, and bonus features. Developer Eyecon has been running as a successful computer game company for over 20 years. Two years after it was founded their online casino took off and their first slot game was introduced in 2003. They are one of industry’s leading online slot game developers for bingo and casino based websites. Eyecon have produced over 60 high quality popular and timeless games available to players across many online gaming platforms. Each game is created to provide every player with a game they can enjoy for a long time and each year more players and playing unique games with Eyecon on Easy. ows and 10 fixed pay line online slot game which focuses on Chinese New Year where the people of China dress in lion costumes and dance in the streets celebrating their culture. You can make a bet between 1p to 50p per spin and choose how many lines you want anything from 1 to 25. The symbols in the game include golden coins, Chinese writings, drums, the sun, a Chinese house roof, Chinese Dragon and golden high value symbols cards – A, K, Q and J. The wild symbol in this game in a lettuce which is symbolic in Chinese New Year celebrations as it represents wealth and luck. The lettuce substitutes any other symbols in the game except for the scattered lion, crackers and envelope, these are scatter and bonus symbols. When a wild contributes to a winning combination your winnings will be doubled. 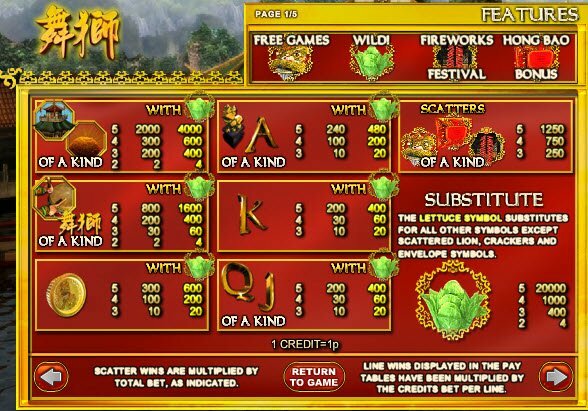 As you’d expect the lion is the main character in this game, this scatter symbol awards pays of 5, 15 and 25 times the total bet if you get 3, 4 or 5 such symbols, you will also up to additional 25 free spins awarding you with extra lion and lettuce symbols. Chinese New Year wouldn’t be complete without some fireworks. If you get 3, 4 or 5 cracker symbols you gain free entry to the fireworks festival round in which you will get 3, 4 or 5 picks with the chance to uncover 2, 5, 10, 25 or even a 100 times worth the total bet. You will be given the chance to experience other Chinese New Year celebrations through the Hong Bao bonus round. Hong Bao is where red envelopes containing money are giving out during the celebrations. To start the feature, you must line up 3 or more scattered envelopes and pick an envelope from the highlighted row to reveal up to 200 times worth your total stake. There is also a gamble bonus round which will allow you gamble your bet or double your win. Click here to learn more slot games. The background in the game offers spectacular gaming experience as you overlook Emperor’s Palace you’ll feet part of the Chinese celebrations. 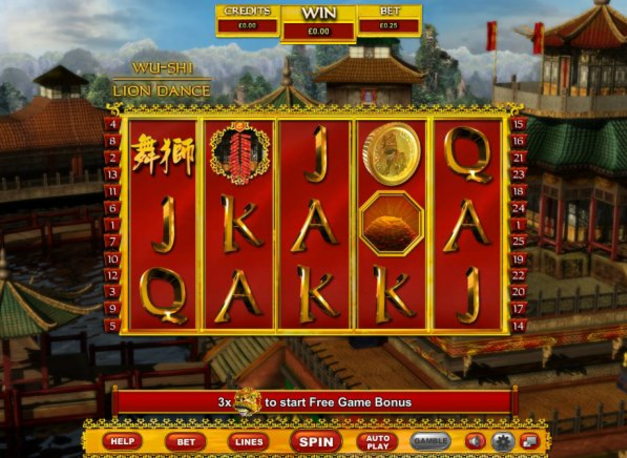 It is a traditional and popular slot game enjoyed by many with plenty of opportunities to win. Despite it’s seasonal theme Lion dance is well designed and creative game that can be enjoyed all year round. RTP 97.24%. An equally massive game is our Big Top slot.